Despite the expense of both the course and lost shop revenue, some auto body technicians refuse or fail to take automaker training courses seriously — leading to blown tests and missed chances for certification, according to a panel of OEM instructors. At the same time, OEMs are sensitive to trade workers who might not perform well in a traditional classroom setting or in tests. 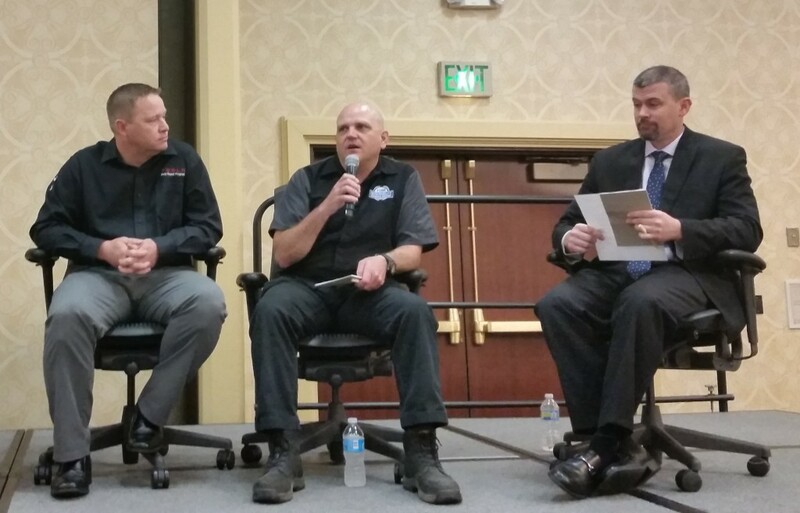 They’re attempting to structure programs to account for this and other factors, automaker training representatives said Wednesday at the Society of Collision Repair Specialists’ 2016 Repairer Roundtable. 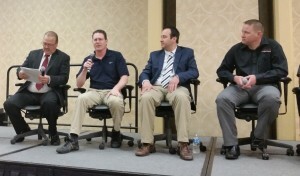 The forum, held right before the spring Collision Industry Conference in Seattle, included panelists Jason Bartanen, I-CAR industry technical relations director (there to represent Jaguar Land Rover’s program); Toyota collision training administrator Joe DiDonato and repair/refinish training assistant manager Eric Mendoza; Audi collision repair training instructor and curriculum designer Shawn Hart; and Tesla body repair program technical manager Kelly Logan. The majority of technicians learn by “doing it,” according to Hart’s experience with Audi. “They’re not used to sitting, and listening to somebody,” he said. Audi certainly tests welding, but Hart joked it might not even feel like a test — “You get to weld,” which is fun. So far, 100 percent have passed it, he said. Logan said Tesla had a similar philosophy, splitting training into 25 percent classroom time and 75 percent “workshop, hands-on” because of technician preferences for work over a classroom. Technicians often weren’t aware it was a pass-fail course, according to Logan. Some fail. “Most of it is psychological,” he said. Some techs even give up Wednesday of a five-day course. “At that point, it’s really frustrating for us,” Logan said. Tesla used to have a one-week welding training program, and while representatives of shops doing more higher-end vehicles “typically have no problems,” there were “a lot of struggles” for those who’d never worked much aluminum. Now, the program lasts two weeks: A week of training, and a week of testing. Anyone who passes the test before the end of the second week can leave early. Tesla tries to eschew written tests too on subjects like structural repair, as a technician who might be able to perfectly install rivets or set up a welder might be unable of writing down the same steps. “We’re looking at more in-the-shop environment,” he said. Finally, Tesla is looking at an online learning-management system to give as much information as possible before the training seminar, thereby minimizing the time a technician spends away from the shop. In that vein, Bartanen said JLR demands technicians know their stuff before training and testing — mostly testing — begins in Appelton, Wisc. More so now — the Jaguar Land Rover global test is harder than in the past, according to Bartanen. Some technicians returned after failing once, tried to coast, and then realized the material was “significantly different,” he said. But the word’s getting out, he said. In the past, JLR also noticed shops sending a staffer not at all qualified to attend. “We don’t get that anymore,” he said — it’s the actual technicians doing Jag and Land Rover repairs, not the men or women the shop can live without for a week. Finally, the course lets students who failed the first time but pass early on the retake leave early, according to Bartanen. “When they go back, they certainly polish up on their skills,” he said. Toyota pre- and post-tests, which allows it to vet the level of incoming students’ knowledge prior to the course and ensure they learned something, according to Mendoza. It holds Toyota accountable, he said. DiDonato said Toyota tries to teach critical thinking and going back to basics — otherwise, technicians’s ability stays limited. “Most of the technicians do not know how to operate the equipment,” DiDonato said. “We try to break the welder,” he said, and see if the students can troubleshoot the problem.